Or, Is It Time to Look for an Alternative? With so many risks among ammonia refrigeration systems traditionally placed in ice rinks and other commercial applications where nearby businesses and roads are evacuated every time there is a leak. It’s time to ask… is there a reliable, affordable, safe alternative to an ammonia system? As history has shown there is no denying that older ammonia refrigeration systems must be replaced. Why then would a town, school, or collegiate facility purchase another high maintenance and potentially lethal ammonia plant? To be fair, an ammonia system is an environmentally friendly refrigerant with a Global Warming Potential of zero and is a very efficient refrigerant requiring less horsepower to operate to perform the same work as a Freon refrigerant. Ammonia, however, is toxic and comes with many pitfalls. A major leak is an extremely dangerous situation requiring evacuations and HAZMAT teams to respond. The maintenance costs of ammonia are higher and it produces a waste oil from compressors. All service must be performed by a licensed trained technician, usually an outside vendor. External heat exchangers are the only method to capture a usable heat from an ammonia system and they come at a considerable cost. The average single sheet ammonia system has a charge of 700 to 1000 pounds of ammonia and a dual sheet at 30% more – these are very large charges. Refrigeration Room construction and requirements are special in nature and comes with an additional cost of construction. an ammonia plant. Typically, ammonia refrigeration systems in ice rinks maintain 700-1000lbs of ammonia with varying levels of staff expertise spanning decades. 1) Safety in Numbers: Emerald Environmental Technologies’ ice3 Cube Refrigeration System is a closed system of 21-24lb incremental portions of refrigerant housed within modular ice3 cubes. Because each ice3 chiller carries only 21-24lbs of R410A, a green refrigerant, a safe ammonia-free ice rink refrigeration mechanical room is automatically created. Local Fire Stations love to erase this worry from their lists while arenas are able to avoid the HAZMAT expense of training and equipment needed to stay current and safe. 2) Cost Savings: 100% heating and cooling capacities. Each ice3 Cube Refrigeration Cube produces heat, like all typical refrigeration systems, however this heat is recaptured and put to use! That’s right: radiant floor heat, warm lobbies, ice pit melting, and locker room heat is possible with the free heat produced from the everyday use of the ice3 Cubes. Emerald Environmental Technologies ice3 Cube System fully embraces the “use it or lose it” mantra. By directing what would be waste heat from your refrigeration or air conditioning system to other facility needs, waste heat becomes an asset waiting to be harnessed and is a primary consideration in all of our designs. 3) Parts? Easy: The ice3 Cubes are comprised of “off the shelf” components resulting in readily accessible parts from local wholesalers allowing a vast quantity of available parts. 4) Quiet and Reliable: Quiet! A concrete mechanical room with ten ice3 Cubes running only registers a mild 57 decibels. So quiet in fact, one facility placed their mechanical room right NEXT to the conference room. 5) Quality: Each ice3 Cube is made to be reliable and efficient for a long life and fewer maintenance costs. Each ice3 Cube is fully tested on the Emerald Environmental Technologies’ testing station before shipment and installation. 6) Versatile with Minimally Invasive Installation Options: Small and stackable, with a footprint of less than 9 square feet, each ice3 Cube can fit through a standard 36″ door, allowing installations on any level or floor of a facility making it an excellent candidate for difficult retrofits requirements. 7) Decreased Environmental Footprint: Each ice3 Cube not only uses minimal electric power due to its precise operation (allowed by its Complete Digital Control System that comes standard on each ice3 Cube) but the excess heat produced is put to work within the facility to reduce or eliminate operational costs. 8) Ultimate Comfort and Humidity Control: Every rink manager knows that humidity is a constant challenge. 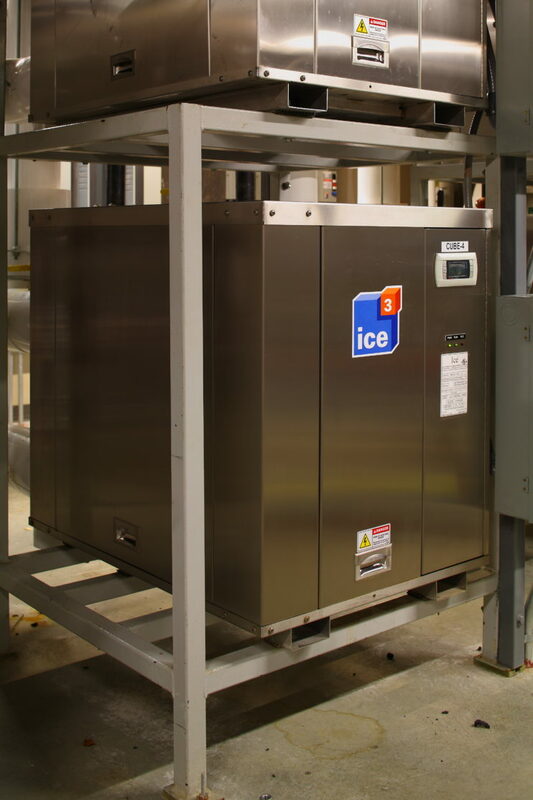 The ice3 unrivaled humidity removal process and improves indoor air quality. Looking for an alternative? Take a look at Emerald’s ice3 Cube Refrigeration System’ Case Studies for the varied examples of how facilities have taken advantage of so many benefits in ease of operation, reduced operational costs, and precise output. ice3 Cubes may be the alternative you’ve been looking for. Give us a call for a free consultation 888-530-7713.